Today I went to Kappa-bashi. Kappa-bashi is located next to Asakusa, the traditional down town center in front of the oldest temple "Sensouji". 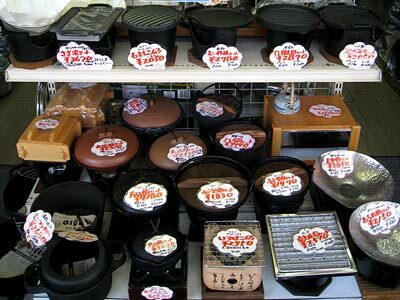 Kappa-bashi has a famous shopping street filled with more than 170 specialty shops for equipments and utensils used in professional kitchens and restaurants. In bigger cities in Japan we can find several areas where wholesale or retail shops are concentrated. In case of Tokyo there are for example Kanda for books, Akihabara for electro goods, Asakusabashi for toys and dolls, Nippori for confectionery and Uguisudani for furniture. Many of them have their origin in the city planning surrounding a castle in the feudal time, while others developed in more recent times from various reasons. Kappa-bashi started at the beginning of the 20th century as an area of second hand stores, and shifted to the shopping center for cooking and baking utensils after WWII. Now, the shops in Kappa-bashi as a whole take care of restaurants, from their designing, construction, installation and provision of all kinds of goods for their operation. 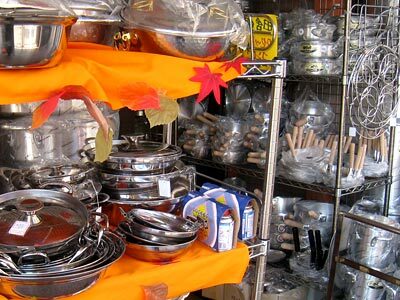 The variety of goods is amazing, their prices are reasonable indeed and they have professional quality. They have many interesting goods. Sample foods for example attract young people and foreign tourists. Many Japanese restaurants explain visitors what they can eat there by showing samples in their show windows. This is a good tradition, I believe, because you can visually confirm what you can eat before you enter a restaurant. In many cases the naming for a dish cannot give us a faintest idea what it is. Even when some explanations are added to the name, it is not easy to imagine something which you have never eaten. Visual information is qualitatively different from text in understanding the contents of a food. Especially the food samples in Japan look so real, that you might take it for the genuine article. Such food samples are nowadays popular as souvenirs. You might be able to buy a deliciously looking tuna sushi model, cheaper than the real one. 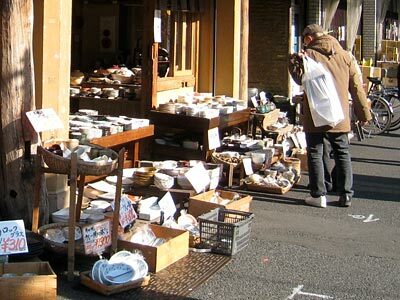 You can find in Kappa-bashi all kinds of ceramic tableware. 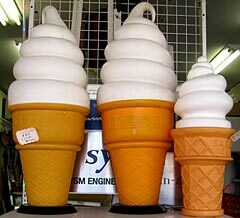 In other shops you can find interesting equipments such as signboards, shop curtains and attractions in front of a restaurant, such as huge models of ice-cream. You can buy also uniforms for cooks and waitresses. There are also many knife shops. However, you must think about the safety regulations of air plains when you buy extreme sharp Japanese cooking knives. 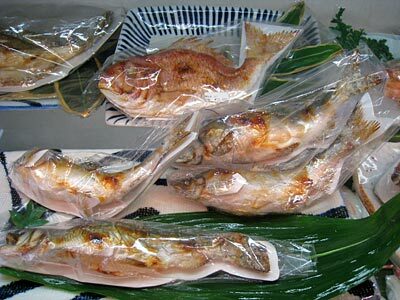 By the way, concerning the origin of "Kappa" of "Kappa-bashi" two kinds of interpretation exist. The one is that the word comes from friendly monsters "Kappa", who helped people in building an irrigation system to combat flood. Others say that samurais working in a nearby palace of a feudal load used to manufacture raincoats and sell them in this area to earn additional income. Raincoat was called "kappa" which came from the Portuguese word "capa". Which theory do you like? 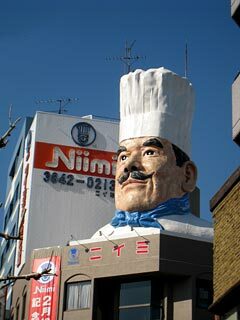 The gateway of Kappa-bashi shopping area is guarded by this huge head of a cook. You cannot miss it.